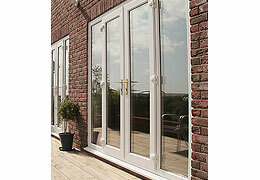 Industry leading Composite and Upvc Doors in the Worcester area. Imagine open, wide spaces allowing air and light to flood into your home, instantly generating a contemporary look and feel. Industry leading composite door, constructed of materials to give you the very best in strength, easy maintenance, security and weather resistance. Ideal for a wide range of uses and compliment any conservatory whilst creating a unique design statement within your home. Inline sliders or patio doors as they are known are ideal for a wide range of uses and compliment any conservatory or exit outdoors. The PVC-u door is fully compatible with the VEKA MatrixFS system to ensure clean aesthetics running through your home. Whether it is a new front door or a new rear or side door you require, we have the design, style and colour to suit your property. Each door is complimented by using the high security door locking covered by the outstanding Maco Secure Plus guarantee which features our unique multi locking system with 10 year guarantee. Our new doors come with security features including multi-point locking, extremely strong, slim line and adjustable hinges and hook-bolts to help keep your home safe and secure. All locks and levers use high-quality multi point mechanisms enabling the door to be pulled in tight ensuring full weatherproofing and added security. Our PVCu doors offer unrivalled security. 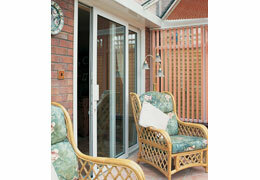 Hinges, locks and keeps are fixed directly into the door’s fully steel reinforced frame for your complete peace of mind. The doors are available in a wide range of 18 colour finishes with an outstanding choice of panels. All our PVC-u doors are installed with double glazed toughened safety glass sealed units, whether they are leaded, bevelled or just obscure glass, they all enjoy a comprehensive 10 year guarantee. Practical, durable and attractive, side lights and fan lights can enhance your home’s appearance and let in more light, for a brighter, warmer feel. All of the profiles used in the side lights and fan lights have the same colour options as the door and window profile, so you will find it an exact match in colour and design. 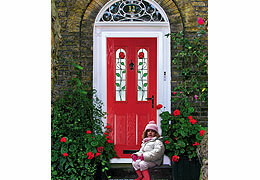 Not all doors are the same… there are many, many styles and apertures to which a front door is required to be fitted into. 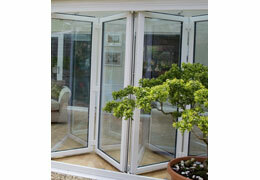 We can manufacture and install a singular door or double French doors into an arched opening. These doors can be opened inwardly or outwards, to suit your circumstances. 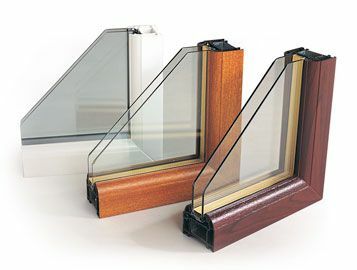 The choice of glazing, panels, hardware etc. that can be used is all down to personal choice. Hardware such as lever/lever handles, pad/lever handles, hinges, door knockers etc. are available in a variety of finishes including white, gold, satin chrome, bright chrome, bronze, black etc. We also install spy holes, cat flaps and letterboxes to suit your requirements. Galvanised steel reinforcing is a vital component in the strength, durability and longevity of window and door systems. All our products are manufactured exactly to VEKA PLC specifications using VEKA approved galvanised Steel. The energy performance rating is dramatically affected once you introduce steel reinforcing. All our products are energy rated including steel reinforcing where required. The first thing you want from a door is to keep the bad guys out. This video show how weak your doors are in real life on a real home with the most common break-in method.